Planning the perfect trip can be daunting. There’s just so much to think about. Luckily in this age, we have more than enough resources to put together a great itinerary. But before information overwhelm sets in, there is an easy way to organize and store trip ideas. One of the best online tools for this is Pinterest. Using Pinterest to generate travel plans is not only effective, it’s really simple! If you haven’t started using Pinterest yet, you’re not late to the game. It’s still one of the fastest growing websites in the world. Currently (2016) it’s the 22nd most visited website on the planet, beating out weather.com, tripadvisor.com, cnn.com, nba.com, linkedin.com, and the nytimes.com. Today, there over 100 million active users on Pinterest. A staggering 93% of “pinners” have shopped online in the last six months. Though in the beginning, women dominated this social media platform, more and more men are starting to use it too at a substantial rate. It’s not just for clothes, recipes, and dream boards anymore. Today you’ll find “pins” — saved images with resource links — for any topic, especially travel. Want to learn what native New Yorkers recommend for restaurants or activities? It’s all cataloged on Pinterest by millions of users. Travelers now have a great source for information that is visual, helpful, and social. 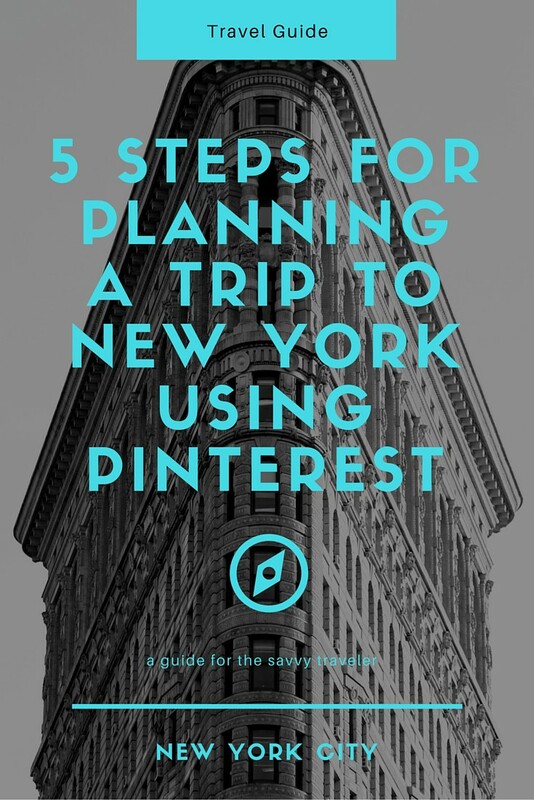 Below are step-by-step instructions on how to use Pinterest for planning an amazing trip to NYC. Create a free account for travel (ours is just for NYC!). Go to www.pinterest.com. If you’re familiar with Pinterest, it’s really just a sea of great resources at your fingertips. You are basically creating a digital pinboard to use later. So really all you have are pins and boards. Create basic travel boards. I like to include boards like Travel, Lodging, Restaurants, Activities, Shopping, Night Life, Maps, etc. If you have specific interests, create those boards too (like Tours, Monuments, NYC Marathon, Business-Related, etc). Some people even add a Dream Board: why not? Once you get the hang of it, you can add more boards and labels later. For now, keep it simple and have as few boards as possible. Here’s an NYC Pinterest account example. Now the fun part! Brainstorm a few things you’d really like to discover in NYC. Those are your keywords. Then go to the search bar and start searching for them. Type in “NYC” or “New York City” and whatever keyword you like. For example, “New York City Museums” is a good query. Take your time scanning and scrolling through the broad range of results. Every image you click connects you to a web page. Those pages are usually blogs and other websites where you can read the full article. Your goal is to save the best resources to your digital pinboards. Be discerning with what you pin. Limit the amount of these pins, as you can’t do everything in NYC. Pin specific photos/links to follow-up on when you’re in New York (more on this later.) When you find a profile that seems to have all the right boards and pins as a whole, follow their profile. You can also just follow a board that has a collection of really great pins. 1. Check out the source of the pin, usually the full article. 2. The pinner’s complete profile and collection. 3. Comments by other Pinterest users (occasionally you’ll get reviews). 4. Others who have saved this pin. Elimination: As you get closer to finalizing your trip plans, start to eliminate or cache pins that are not on your Top 5 or Top 10 list. Pinterest boards can get overpopulated easily when people passively pin items. It’s better to have only high-quality pins to refer to. Save Items Offline: Save important pinned images offline (on the Pinterest App or in your photo collection). That way when you’re on the go, you can quickly access that infographic map, address, or list you need. 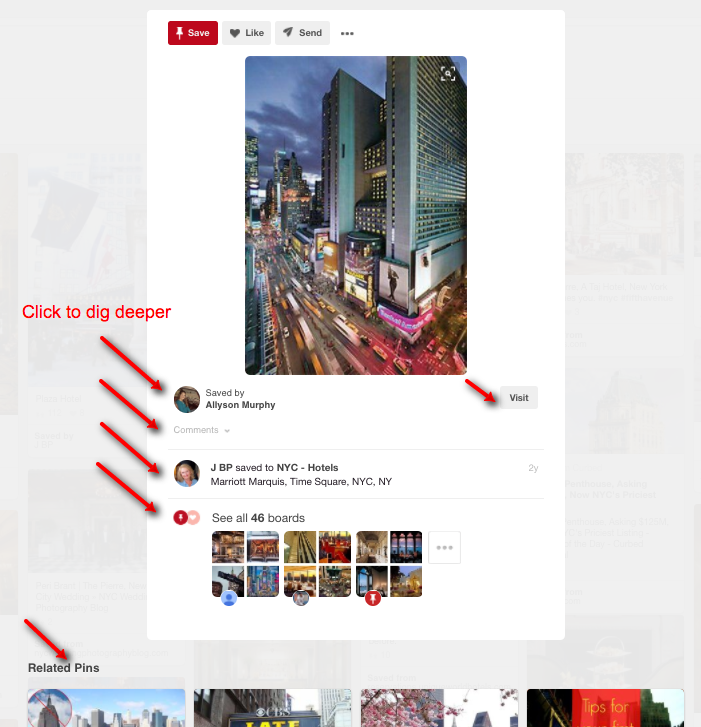 Map Your Pins: One feature Pinterest took off was the ability to create a place/map pin for an entire board. That would have been helpful for planning a trip where each didn’t travel around much within the city. However, you can still generate a map for individual pins. This is very handy because it gives the address and other helpful information. Hearts: Here’s a simple idea for people who plan to return to NYC. Don’t heart anything during the research and setup phase! Heart items after you’ve experienced them. Some people might forget, so if you use a check-in app (like Facebook, Foursquare, or Instagram) it will be documented there for later reference. (However, remember that checking into places sometimes invites stalkers and nothing says “I’m not home, rob me!” like geo-location markers). If the idea of hearting places after you’ve been there is not appealing, some travelers create a “Been There, Done That” board. When they’ve been to a spot, they simply transfer pins to this board and perhaps make a note. Make Notes: Pinterest allows you to make notes for each pin you make. When you’ve been to a spot, you can make a note about the place (like what to order at a restaurant). 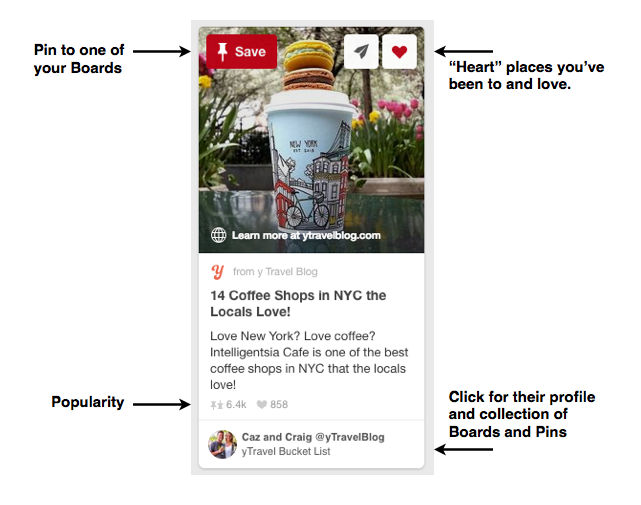 Share Your Pins And Boards: The reason why Pinterest works is because it’s a social platform. People share their good ideas, pin them, and the word gets out. Share your findings with your traveling companions and fellow travelers online! Article provided by Arlie Peyton. Arlie is a former medical center director, state representative for vocational education, and public educator. Learn more at linkedin.com/pro/apeyton.